Sennacherib (Akkadian: Sîn-ahhī-erība; Hebrew: סנחריב, Sankherīb; "Name means::Sîn has replaced my lost brothers") (r. 717-10 BC by Ussher or 705-681 by conventional accounts) was a king of Assyria. His father and predecessor was son of::Shalmaneser V, although conventional Assyriologists and many evangelicals say that he was a son of a king calling himself Sargon II. Sennacherib is best known for his campaign against the Southern Kingdom of Israel—a campaign which failed, though he still boasted of gaining victory in that conflict—and for a reign that ended prematurely when jealous sons murdered him. Sennacherib succeeded his father Shalmaneser V about six years after the Fall of Samaria. He had at least three sons, father of::Adrammelech and father of::Sharezer, and father of::Esarhaddon, the last of whom succeeded him in the kingship. 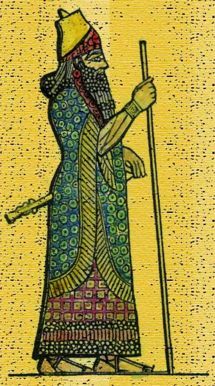 "Sennacherib, the great king, the mighty king, king of the world, king of Assyria, king of the four quarters, the wise shepherd, favorite of the great gods, guardian of right, lover of justice, who lends support, who comes to the aid of the destitute, who performs pious acts, perfect hero, mighty man, first among all princes, the powerful one who consumes the insubmissive, who strikes the wicked with the thunderbolt; the god Assur, the great mountain, an unrivaled kinship has entrusted to me, and above all those who dwell in palaces, has made powerful my weapons; from the upper sea of the setting sun to the lower sea of the rising sun, he has brought the black-headed people in submission at my feet; and mighty kings feared my warfare, leaving their homes and flying alone, like the sidinnu, the bird of the cave, to some inaccessible place..."
For "Sargon" read "Sennacherib," who often called himself "another Sargon" in reference to Sargon I. Tartan was one of Sennacherib's leading generals (though in some secular sources "Tartan" appears as a nickname for the interpolated ruler named "Sargon"). "In my third campaign, I went against the Hittite-land. Lulê, king of Sidon, the terrifying splendor of my sovereignty overcame him, and far off into the midst of the sea he fled. There he died. Great Sidon, Little Sidon, Bît-Zitti, Zaribtu, Mahalliba, Ushu, Akzib, Akko, his strong, walled cities, where there were fodder and drink, for his garrisons, the terrors of the weapon of Assur, my lord, overpowered them and they bowed in submission at my feet. I seated Tuba'lu on the royal throne over them, and tribute, gifts for my majesty, I imposed upon him for all time, without ceasing. From Menachem, the Shamsimurunite, Tuba'lu the Sidonite, Abdi-liti the Arvadite, Uru-milki the Gublite, Mitinti the Ashdodite Budu-ilu the Beth Ammonite, Kammusu-nadbi the Moabite, Malik-rammu the Edomite, kings of Amurru, all of them, numerous presents as their heavy tribute, they brought before me for the fourth time, and kissed my feet. But Sidka, the king of Ashkelon, who had not submitted to my yoke, the gods of his father's house, himself, his wife, his sons, his daughters, his brothers, the seed of his paternal house, I tore away and brought to Assyria. Sharru-lu-dari, son of Rukibti, their former king, I set over the people of Ashkelon, and I imposed upon him the payment of tribute: presents to my majesty. He accepted my yoke. In the course of my campaign, Beth-Dagon, Joppa, Banaibarka, Asuru, cities of Sidka, who had not speedily bowed in submission at my feet, I besieged, I conquered, I carried off their spoil. The officials, nobles, and people of Ekron, who had thrown Padi their king—bound by oath and curse of Assyria—into fetters of iron and had given him over to Hezekiah, the Judahite—he kept him in confinement like an enemy—their heart became afraid, and they called upon the Egyptian kings, the bowmen, chariots and horses of the king of Meluhha (Ethiopia), a countless host, and these came to their aid. In the neighborhood of Eltekeh, their ranks being drawn up before me, they offered battle. With the aid of Assur, my lord, I fought with them and brought about their defeat. The Egyptian charioteers and princes, together with the Ethiopian king's charioteers, my hands captured alive in the midst of the battle. Eltekeh and Timnah I besieged, I captured, and I took away their spoil. I approached Ekron and slew the governors and nobles who had rebelled, and hung their bodies on stakes around the city. The inhabitants who rebelled and treated (Assyria) lightly I counted as spoil. The rest of them, who were not guilty of rebellion and contempt, for whom there was no punishment, I declared their pardon. Padi, their king, I brought out to Jerusalem, set him on the royal throne over them, and imposed upon him my royal tribute." However, the Bible has no warrant for Sennacherib having made King Padi, or any other Philistine king, a puppet king in Jerusalem. We now turn to Sennacherib's direct campaign against Hezekiah. This happened in the fourteenth year of Hezekiah's reign, which Ussher places at 713 BC and Thiele places at 701 BC, but only because Assyriologists insist that this campaign took place at this time. Hezekiah refused to honor the treaties that his predecessor Jehoahaz I had made with successor of::Shalmaneser V (II_Kings 18:7 ). Shalmaneser captured Samaria in the fourth through sixth years of Hezekiah and the seventh through ninth years of Hoshea. In the fourteenth year of Hezekiah, Sennacherib came against the Southern Kingdom in force, capturing several border cities. Hezekiah sent a message to Sennacherib at Lachish, a message amounting to a suit for peace. Sennacherib demanded, and got, 300 talents of silver and 30 talents of gold. Even after receiving this tribute, Sennacherib pressed his attack still more. He sent his generals, Tartan and Rabsaris and Rabshakeh, to Jerusalem with a very large force. Rabshakeh shouted a boastful speech to the defenders, who reported it to Hezekiah. Hezekiah responded with prayer and by consulting his best adviser, Isaiah. That night, 185,000 Assyrians died mysteriously. Sennacherib returned to his capital city of Nineveh, where his two sons eventually murdered him. Sennacherib boasts that he accepted the tribute after his siege of Jerusalem, not before. Furthermore, Sennacherib overstates the tribute, saying that he received 800 talents of silver, not the 300 that the Bible says he received. Finally, Sennacherib does not mention losing 185,000 men to any unidentified pestilence—but in view of his vainglorious attitude, one can repose little confidence in this omission. The Bible says that Sennacherib's two sons Adrammelech and Sharezer murdered him. Simo Parpola identifies Adrammelech and Sharezer as one and the same man, named Arad-Ninlil. Sennacherib's son succeeded by::Esarhaddon reigned in his stead. Modern Assyriologists hold that Esarhaddon began to reign in 683 BC. Ussher, however, says that he began to reign much sooner and reigned for far longer. This page was last modified on 14 February 2014, at 18:28.